The actions and body language of the Wolves on the court suggested they were either trembling at the mere sight of former teammate Jimmy Butler, or just weren’t up to the challenge. *The Timberwolves are 17-14 since the 4-9 start that preceded the Jimmy Butler trade to Philadelphia, so in a broad sense they have proved they can win without him. 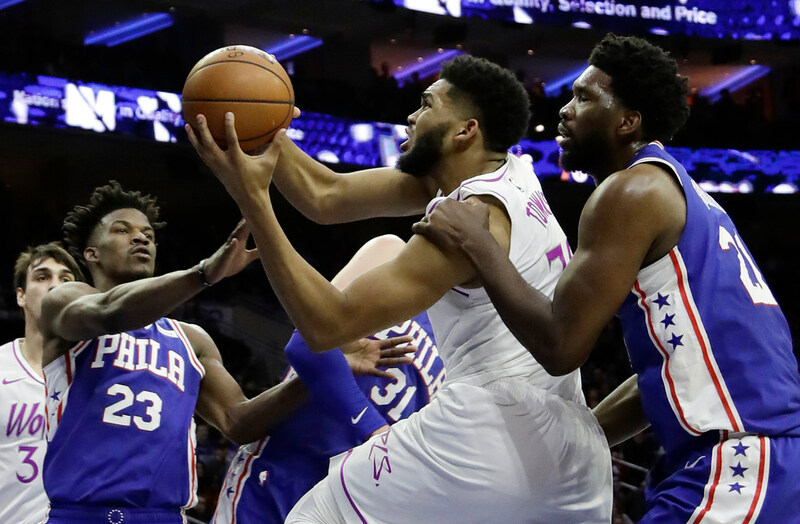 But in that 14th loss, a 149-107 embarrassment Tuesday in Philadelphia in the first meeting between the teams since the trade, Minnesota — and particularly its young core players — seemed intent on proving Butler right: That they can’t win without him. A variation of that sentiment was part of Butler’s profanity-laced shout upon returning to practice in October during a tense seven-week stretch that preceded the trade. Its intent was likely more figurative than literal: Hammering home to his bosses and teammates that Butler’s inner drive, talent and competitiveness above all else were the things that transformed the Wolves into a 47-win team last season. Winning 17 of 30 games since the trade was a nice counterpoint, but Tuesday offered a chance for Karl-Anthony Towns and Andrew Wiggins to deliver their sharpest refutation of Butler’s assertion. Instead, their actions and body language on the court suggested they were either trembling at the mere sight of their former teammate or just weren’t up to the challenge. Towns had just 13 points and three rebounds in 28 minutes, going a minus-42 while being dominated by Joel Embiid (31 points, 13 rebounds). Wiggins supplied 12 points and was a minus-25 in his 27 minutes. Since his 40 point, 10 rebound outburst in Ryan Saunders’ debut, in which he went 16 of 18 free throws, Wiggins is averaging 15.7 points and has shot 11 free throws combined. So much for Saunders unlocking all that potential, at least immediately. Butler had 19 points in 28 minutes on an efficient 8 of 10 shooting night. Embiid, as noted, was a monster. His other new young running mate, Ben Simmons, was tremendous as well in finishing just one assist shy of a triple double. If part of the reason Butler wanted out was because he found Towns and Wiggins lacking in key areas, Tuesday was validation. The only good news for the Wolves is that it only counts as one loss in the standings — and they will have a chance for revenge March 30 when these teams meet again at Target Center. Towns, Wiggins and co. better bring a different energy to that game if they ever want to lay the Butler Era here to rest. *A Detroit TV station did a segment on Lions players starting a social justice program, which is certainly a worthy cause. In setting up the segment they used game footage from this season, a common device on a TV segment. Rather humorously, though, the play they picked was the Vikings completing a Hail Mary in their Week 16 victory at Ford Field. *After a rough stretch in December when he allowed at least five goals in four consecutive games, Wild goalie prospect Kaapo Kahkonen is back to playing well for the AHL’s Iowa Wild. He has a .943 save percentage in his last six games, including two shutouts. The 22-year-old Finnish goalie, a 2014 fourth-round pick, has a 2.43 goals against average and .918 save percentage for the season.